If you’re like most cat owners, you want to spoil your cat as often as possible. There are a number of treats and toys available that can be used to do just that. Everyone knows they can use treats to reward their dogs for good behavior or just to show them a little extra affection, however many don’t realize that there are cat treats designed for the very same purpose. Thankfully, Pro Pet offers a wonderful line of cat treats that can be trusted by cat owners everywhere. There are a number of reasons why cat treats are needed. They serve every purpose from just adding an extra bit of love to the day to helping medicate and provide health benefits. Just like dogs, birds, or any other pet, cats need to be rewarded and feel loved as often as possible. Providing your cat consistent love with the aid of treats and rewards will help them learn to trust you and feel better about taking medication, accepting grooming, or even in learning tricks! Cat training is an up and coming hobby thanks to shows like America’s Got Talent, which have featured professionally trained cats in recent years. Cats can be trained to do everything from sit to dance and other tasks, just like any dog could be. Whether you are looking for a treat to make medications easier to administer, build trust, or get your cat onboard with becoming the next big viral sensation, Pet Pro has offerings that cannot be beat. Below, we will discuss many of the reasons why cat treats are necessary in cat ownership. Especially when you have recently taken in a new cat, you will want to offer treats as often as possible to build trust. Some cats are slow to trust, but the way to the heart is definitely through the stomach and the taste buds. A good treat can let a new cat know that you are a friendly person who wants them to have plenty to eat and enjoy a delicious snack. If your cat needs medication, they can sometimes be stubborn against taking it. The same is true for supplements. A good trick is to hide this supplement or medication within a delicious treat. When a cat gets a treat, they will often consume it too quickly to detect any tricky extras. This deposits the medicine and supplement directly into the kitty’s system without fight or fuss. Some treats are specially formulated to provide dental care for your cat. This makes their teeth stronger and cleaner than most. Cats mouths do not chew like dogs, so their teeth can take more damage over time due to a lack of natural cleaning process. A specially formulated cat treat is a viable solution. We've researched and tested a number of different cat treats, so we know a thing or two about which ones are worth their price tag and which should be avoided. They in a variety of forms, from sprays to foods or even simple dried flake treats. Each treat serves its own purpose and is worth your consideration. Below, we will discuss some of our favorite cat treats offered by Pro Pet. Cosmic Catnip Tuna are dried flakes of tuna that are pliable and delicious for your cat. These are the types of treats mentioned above that work well for hiding supplements or medication. They are also a great treat to offer a new cat that is working hard to build trust for you. While some people are hesitant to offer tuna flakes for treats because of the fear of smell, the drying process of this treat helps to eliminate the strong odor of the otherwise pungent fish. This results in a delicious treat for your cat that is clean and pleasant to offer. The flakes certainly serve their purpose and offer cats a treat they can enjoy. Unfortunately, there is also a pesky smell to them that leaves much to be desired. Because of this, they rate in at 3 of 5 stars on our list. PREMIUM INGREDIENTS: With six recipes cats absolutely love, plus innovative ingredients used to fight plaque and tartar, these delicious treats are rewarding for cats and their parents. ALLERGEN FRIENDLY: Discerning pet owners will love that they're grain free, gluten free, soy free, and dairy free. 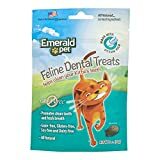 DELICIOUS AND HEALTHY: Emerald Pet Feline Dental Treats are the healthy grain free dental solution your cat will love! These all natural and nutritious crunchy treats are irresistible to cats. BETTER DENTAL CARE: Whimsical fish shaped treats are big enough to encourage chewing versus just swallowing for maximum dental health. FAMILY OWNED: We are a family owned company dedicated to pet specialty retailers and made in the USA using premium US ingredients. This line of dental treats is effective in removing plaque and keeping your cat’s breath smelling its best. The treats actually work to combat bacteria within the mouth to prevent dental infections and other issues. Cats are susceptible to tooth issues because they have lost their natural abilities to clean their own teeth. Offering a dental treat regularly can help their teeth stay stronger later into life. When teeth are stronger, your cat will eat better and when the cat eats better, their life is happier and more fulfilled. The dental health qualities of this treat are great, but there is much to be desired, it seems, in terms of taste. Some cats simply don’t like and won’t eat them, so they rate at 3 of 5 stars on today’s list. Meowtinis Soft & Moist Cat Treats is a treat that, again, can be used to offer medication or supplements or simply to gain trust of a new pet. Soft treats are a favorite for cats because they offer something different than their usual kibble. Meowtinis are great for sneaking medication or gaining trust, but there isn’t much to them in terms of health benefits. That earns them three of five stars. Rather than being something your cat consumes, this mist is something your cat breathes in. It releases a pleasant odor that is infused with natural supplements that make your cat feel happier and calmer. This is a great treat to offer a new cat or a cat that has recently undergone surgery or something traumatic. Bliss Mist is a great treat because it leaves cats feeling calm and happy, but it doesn’t offer many health benefits, nor does it satisfy anyone’s hunger. This gets it 4/5 stars. These twig toy treats are hard treats that cats are inspired to chew on regularly. This helps them regain the natural teeth care habits that your cat was born with. They will be more likely to remove their own plaque naturally thanks to the process of chewing. Special scents and taste infusions can provide inspiration to your cat to keep on chewing. Matatabi isn’t for every cat. Some cats simply don’t understand or see the use in a treat that is so much work to get into. While it has numerous health benefits, it can take some convincing for certain pets, so we can only score it four of five stars. Cat grass is a plant that grows and invites your cat to chew on it. It makes for a pretty plant in the window as well as a delicious treat that will promote your cat’s natural dental care routine and foraging instinct. Cats gain nutrients and are able to satisfy their natural knack for curiosity using this grow-it-yourself treat. Nibble-Licious serves as a houseplant and a treat, but it can be a nuisance to grow. This means it only scores 4 of 5 stars. Kitty Hoots Organic Catnip is an organically grown catnip treat that will provide your cat all the best benefits of the treat without any of the chemicals that are sometimes infused into catnip by other manufacturers. Catnip has natural calming qualities that cats need. You will often find that a cat that has recently indulged in a catnip treat is more laid back and loving than usual. This is a good treat to offer if your cat has recently had a troubling experience or is about to visit the vet. Catnip is a tried and true cat treat, but some don’t like it for personal reasons. It can be messy and its health benefits are up in the air. This gets it 4/5 stars. Freeze Dried Chicken is, again, a treat that has been processed in a way to eliminate the smell and enhance cleanliness while still preserving the taste of the natural ingredients of the treat. Freeze dried chicken is a favorite among cats because it doesn’t involve a lot of artificial flavoring ingredients or chemicals that can cause your cat to feel ill after taking a less natural treat. While the chicken is definitely not as harsh smelling as the tuna, there’s still a bit to be desired when it comes to the attractiveness of this treat. This gets it 4/5 stars. Cats love milk treats. This treat is made with real milk and is a pour-out liquid treat that your cat can indulge in for added calm and relaxation. This treat can be served at room temperature or warmed, which can also benefit your cat by calming an upset stomach. This is a good treat to keep on hand for these occasions. CatSip is healthy, nurturing, and delicious. What more can you want? This treat earns a solid 5/5 stars. Go Ahead, Turn The Bag Around And Look At Our Ingredients. Purebites Are Made With Only 1 Ingredient; 100% Pure Usa Sourced & Made Chicken Breast. Cats Love The Taste Of Purebites Because Our Treats Are Freeze Dried Raw To Lock In The Aroma, Texture And Freshness They Crave. Cat Parents Love Purebites Because Our Treats Are 100% Pure And Rich In Nutrients For A Happy And Healthy Life. Purebites Chicken Breast Is Proudly Sourced & Made In The Usa And Is High In Protein With On Average 2 Calories Per Treat. Our Products Are Ideal For Cats With Health Issues Or Pets That Are Overweight, Diabetic, Have Allergies, Gastrointestinal Disorders, Or Are On A Restricted Diet. Purebites is everything you would expect a cat treat to be. It is formulated to be delicious and healthy with just enough crunch to also benefit a cat’s dental health. The treats are made with all-natural ingredients and come in a variety of flavors to suit any cat’s individual tastes and preferences. Purebites is delicious, healthy, and good for the teeth. We gave this one a solid 5/5. There are a number of reasons to reward your cat with regular treats. These reasons range from health benefits to relationship building and more. Pet Pro has a number of great cat treat options available on their website, coming from numerous retailers and manufacturers. If you are interested in purchasing a new cat treat for your pet, then Pet Pro is the place to start your search. Cat treats can come in a variety of forms from crunchy powder-based treats to softer formulas, dried natural ingredients, chewing sticks, grass, dried plants, liquid, sprays, and more. Finding the cat treat that your pet prefers is key. Fortunately, you can find everything you need in one place to order and try at your own discretion.